The PN-70TW3A/60TW3A touchscreen LCD monitors boast wireless connectivity that enables a range of different devices to connect to them. Information from those devices can be displayed in a 2 x 2 split screen, allowing for highly productive interactions. Using SHARP Touch Viewing Software, you can manipulate various file types in the same work area. The pen digitizer function, meanwhile, distinguishes between pen and finger input and supports natural and seamless operation. 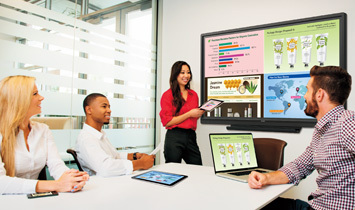 These and other superb BIG PAD features are sure to boost creativity and participation levels in presentations and small-scale meetings, while fulfilling the growing demand for cable-free connection of BYOD. Now there’s no need to mess about with tangled wires or conversion adapters when you want to share your ideas. The PN-70TW3A/60TW3A has a built-in wireless controller that enables multiple devices—including Mac or Windows® computers, smartphones, and tablets—to connect wirelessly via dedicated connection software. Mac and Windows users also have a handy option for quick, temporary connection: they can launch the wireless connection software on the bundled token without pre-installing anything. Thanks to wireless connectivity on the PN-70TW3A/60TW3A, meeting participants can bring their own devices (BYOD) and enjoy speedy and active communications. Note: Connection software is downloadable from the App Store (iOS®) or Google Play (Android™). The PN-70TW3A/60TW3A can connect wirelessly with multiple mobile devices and simultaneously display the onscreen contents of those devices in a 2 x 2 split screen. Alternatively, any one of the individual screens can be enlarged to full-screen size. The screen can be switched either from the BIG PAD or from a connected device. Because data is not stored during wireless connection, there's no need to worry about any leakage of confidential information from a discussion or presentation. The PN-70TW3A/60TW3A can be quickly switched to enable use of Direct Drawing, a user-friendly function that’s just like using a whiteboard. Even for first-time users, this simple write-and-erase function is easy and intuitive to operate. Screen captures can be saved as JPEG files on a USB memory device. In overlay mode, you can write annotations on a transparent screen that overlays the visible onscreen content. Text and graphics written on the BIG PAD can be captured—along with the contents on the screen—and saved as JPEG files on a connected USB memory device or on a wirelessly connected Mac or Windows PC. The overlay function is a major boon when you want to share meeting notes with participants and others. Note: Original files or content shown on the screen cannot be accessed directly during overlay mode. 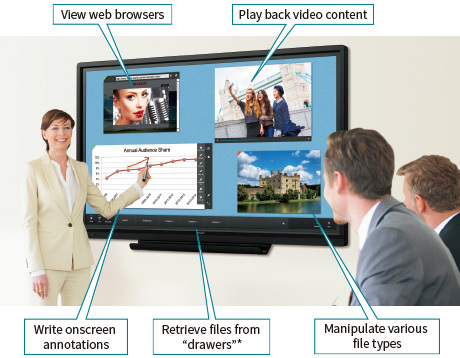 SHARP Touch Viewing Software is a touch-operated onscreen user interface that lets you easily view, manipulate, and write annotations on different types of files, including Microsoft® Office applications, videos, and web pages. Being able to organise a variety of file types in one work area allows you to have more active discussions. * Drawers can be linked to PC folders or network folders. Various kinds of file*—including Microsoft Office files, PDFs, web pages, and image and video files—can be displayed on the screen as "sheets". There's no need to open the respective applications, and you can view all the different files simultaneously in the same work area. * Viewable files: Microsoft Office (Excel®, Word, PowerPoint®), PDF, JPEG/PNG/BMP/TIFF, and WMV/AVI/MP4/FLV. Original Microsoft Office files displayed as "sheets" can be opened easily with compatible applications and edited. Onscreen layouts of "sheets" can be stored for later retrieval, so you can easily restart a discussion where you left off. Note: Download SHARP Touch Viewing Software from the bundled CD-ROM. The PN-70TW3A/60TW3A features a pen digitizer function* that automatically distinguishes pen and finger input, allowing you to perform pen and touch operations without having to switch modes. The bundled touch pen employs a pressure sensor that faithfully renders your writing style. The pen digitizer function is compatible with Microsoft Office (Excel, Word, PowerPoint, OneNote®), Adobe Photoshop®, Adobe Illustrator®, and SHARP Touch Viewing Software. * Not certified by Microsoft. The PN-70TW3A/60TW3A lets you capture ideas at the moment of creation. Recognising up to 10 touch points, they allow up to four people to write at the same time with a finger or touch pen. PN-70TW3A/60TW3A instantly displays an onscreen menu that lets you easily switch input sources, change volume level, or turn the touchscreen function on and off without using a remote controller. A handwriting recognition* function converts selected onscreen handwriting into standard text. This convenient function allows you to utilise onscreen content to make neat and legible minutes of your meetings. Two speakers (10 W + 10 W) are mounted low on the front of the LCD monitor to deliver clearer sound. This software*1 is especially effective for communications with large audiences. 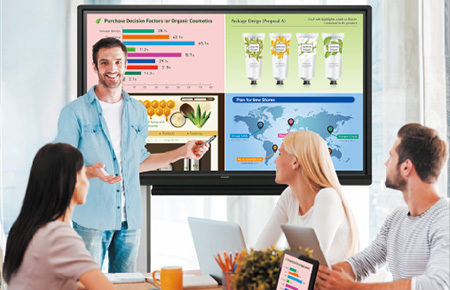 By allowing the BIG PAD to share its onscreen content with up to 50 devices*2, and by enabling the exchange of files between those devices, SHARP Display Connect facilitates lively discussions and paperless meetings in both business and educational settings. *1 Access the downloader on the bundled CD-ROM to install the software. *2 OS requirements (as of March 2017): Host: Windows 7, Windows 8.1, Windows 10; Client: Windows 7, Windows 8.1, Windows 10, Mac OS X v10.7, v10.8, v10.9, v10.10, v10.11, macOS v10.12, Android 2.3–7.1, iOS 6–10. Please comply with the license agreements of your OS and installed applications. Connecting 26 or more mobile devices requires at least two LAN access points.